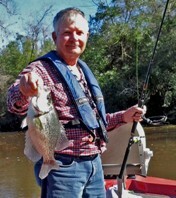 Bens Branch KW - Lake Houston Fishing! Took my jonboat in there Tue morning, no bites, but water was 57 according to a boat I saw in there. Has been 53 up in Caney where I have gone for whites last few times. Looks real good in there, anybody ever have any luck in there? I threw spinnerbaits, shallow crank, wacky senko ( which will almost always get them) and a weighted brush hog...and even a poppin frog not a tap which surprised me. I heard that place is loaded with Tilapia. should have thrown a cast net. Good point, I recall seeing folks fish for them in the past and there would also be large kills of them when the water got real cold. The bass should be eating them I would presume, which in turn should make it a decent spot to catch a few . Theres Bass in there although I have never been there, guys always talking about it. The Talapia in there are bigger than the bass.